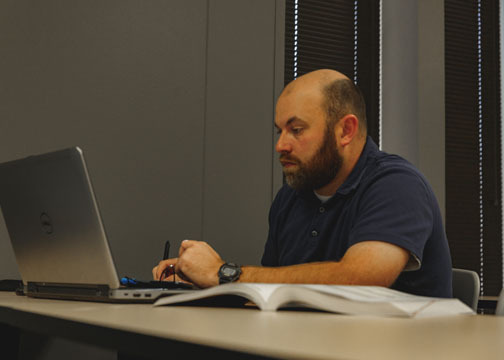 (STATEWIDE) – Across the state, students at Texas State Technical College now have the option of enrolling in and completing a technical award online with the college’s newest 100 percent online programs. The most recent online programs that offer either a certificate or associate degree are Cyber Security, Digital Media Design and Medical Office Specialist. Health Information Technology was the first program to go completely online. It was these online classes that gave Missouri native Kathleen Albert the opportunity of receiving an associate degree from Health Information Technology. The 54-year-old had already spent most of her life working as a certified professional coder, but her dream was to become a registered health information technician and TSTC’s 100 percent online program made it possible. Albert is now working as a Reimbursement Analyst for St. Anthony Medical Center in Missouri and credits all of her success to TSTC’s online program. There are a total of 186 online courses and at least 20 programs such as Surgical Technology, Computer Science and Chemical Dependency Counseling that offer more than 50 percent of its curriculum online. “Our hybrid programs are gaining popularity with students because of their flexibility and convenience,” said Monreal, who is also an online instructor for Anatomy and Physiology. Each hybrid program offers the lecture portion of the class online and all labs on campus. Last semester, TSTC’s online programs had more than 3,000 students enrolled statewide and Monreal said she expects to see annual increases as more courses are added. According to Monreal, the program with the highest enrollment is TSTC’s Academic Core, which includes subjects such as composition, college algebra, history and biology. For Architectural Design and Engineering Graphics student and Edinburg native Gabby Perrett that is the case. She has recently become her father’s temporary caregiver due to illness and driving nearly an hour to campus is no longer an option. The 20-year-old, who is pursuing an associate degree, is currently taking her required English and Mathematic courses. All online course semesters are 15-weeks, online technical certificates and degree programs offer the same degree plan as those offered on campus and all online classes are aligned statewide. To register for an online course a student must apply and satisfy all TSTC admissions requirements, meet with an advisor and successfully complete the Student Online Orientation. Monreal said the future of TSTC’s online course offerings is bright. Their goal is to expand technical degree offerings while maintaining a quality learning experience. Starting in Fall 2018, Business Management Technology and Architectural Design and Engineering Graphics will also offer an associate degree 100 percent online. For more information on TSTC’s online courses or to register, call 956-364-4050 or visit tstc.edu/programlist/courseschedules. This entry was posted in All TSTC on January 15, 2018 by Amanda Sotelo Sotelo.